Who owns Iman Shumpert's head? A Knick whose hair has a knack for getting people talking. Iman Shumpert has the coolest hair in the NBA, and possibly in NBA history. So that's good. But his hair is a little less cool today, with a big triangular hole where there was recently a logo. For Easter, Shumpert had his older brother, Ahrii, trim a cross into the lower left part of his fade. Shumpert, 22, noticed that his fans enjoyed the idea. He wanted another design for the Knicks’ game against the Milwaukee Bucks last week. “I looked down at my flip-flop and saw the Adidas sign, and my brother cut in the back of my head,” Shumpert said Tuesday after the Knicks’ 120-99 win over the Washington Wizards. Shumpert is endorsed by Adidas. The company featured him — and his high-top fade — in a commercial that was released last month. 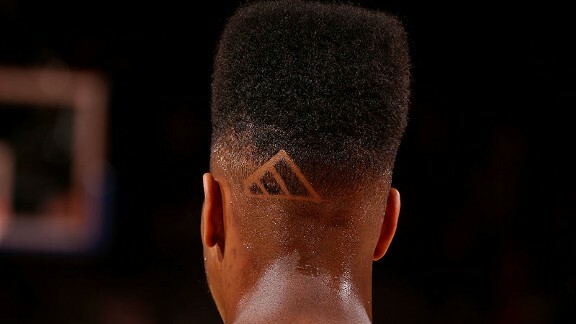 What better way to highlight his hairstyle and Adidas than this way, Shumpert thought. The N.B.A. did not approve the move. By league rules, a player can wear a commercial logo only on his shoes. Not on his jersey. Not on his socks. Not in his hair. After the Knicks’ win over the Bucks last Friday, league officials told Shumpert to remove the Adidas logo. Shumpert apologized to the N.B.A. on his Twitter and Instagram accounts the next day. Where oh where (besides his flip-flops) would Shumpert get the idea that he could do something like this? What made him think he might have say over what logo goes on his head? Oh I don't know, maybe a lifetime of owning his own head. Maybe something about 22-plus years of enjoying the right to look in a mirror as someone wields clippers, making hair decisions like "off the ear," "more product," or "make it taller," gave Shumpert the conviction that what happened on his head was not something he had to call David Stern about. Shumpert had the idea he owns his own hairdo because everyone (or at least, everyone lucky enough to have hair) owns their own hairdos. Except, sometimes, in show business. That's where brand placement is worth a fortune, and people fight for those rights. Imagine if Harrison Ford wanted to spend the entire plot of "The Fugitive" with an Adidas logo on his forehead. No, the producers are not going for that. But even with all those realities as they are ... let me just put it this way: I'm really glad I wasn't the poor sucker who had to tell Shumpert his hair was in violation. It is hard to imagine something more creepy and Big Brotherish. How do you phrase that? "We own your head," just sounds terrible.